Are you one of the guilty ones who bakes their potatoes in foil? If so, you are making a critical kitchen mistake. 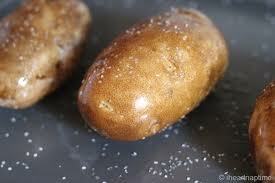 In fact, you are not actually baking the potato but steaming it! 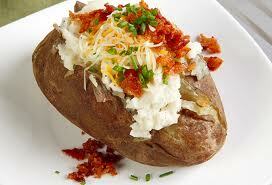 The perfect baked potato has crispy, golden skin on the outside and a steamy, fluffy texture on the inside! To create this bit of perfection simply wash your potatoes well. Dry them and prick tiny holes using a fork time (hence, they won’t explode). Rub some olive oil and kosher salt over them generously and place either directly on a baking sheet in the oven at 400 degrees. Cook for one approximately one hour depending on the size of the potato. Cover with your favorite condiments such as sour cream, butter, and chives and enjoy! Eat the skin as well…not only is it delicious but that is where most of the potassium in a potato is 🙂 After tasting the difference you will never commit the crime of steaming potatoes in foil again! ← Italian Mini Meatballs…Buon Appetito!